"The Passion of The Christ" sparked a national phenomenon at the movies this spring and will now be coming to performing arts theaters and other concert venues when Metropolitan Talent Management, LLC and Icon Productions presents "Music From And Inspired By The Passion of The Christ Tour." The tour is being booked by John Huie of Creative Artists Agency out of Nashville. "The Passion of The Christ Tour" will visit U.S. cities beginning this fall and continuing through Easter 2005, said John Scher, co-CEO of Metropolitan Talent. The live event will be conducted by John Debney, the film's music composer, and will feature a full orchestra, choir, world musicians and vocalists performing music from and inspired by "The Passion of The Christ" set to a visual backdrop, designed by award-winning production designer Wendall Harrington, which will include scenes from the box office smash. "'The Passion of The Christ' was a full sensory experience that lasted well beyond the two-hour theater encounter for millions," said Scher. "We expect the tour to elicit the same emotional response. John Debney's stunning score lends itself beautifully to a live setting, and with a stage set with the world's finest instruments and voices along with multimedia, the live event will be a powerful experience whether you've seen the film or not." "That John Debney has called on his considerable talent to create beautiful, utterly transcendent music that is a fundamental thread to the viewing experience of 'The Passion of the Christ' is without question," said Mel Gibson, director and producer of "The Passion of The Christ." "That his haunting, unforgettable work treads the very thin line between a symphony of epic sweep and an intimate and emotional piece, ethnically true and inspired by the best that all those forms have to offer defies expectation. In so doing, this oeuvre lifts itself up to a rarefied realm where it stands alone, even without the film, as a genuine work of art." "The Passion of The Christ" f enjoyed extraordinary and unprecedented success when it released on February 25 bringing in a worldwide box office of more than $600 million worldwide to date (according to Box Office Mojo). The film experienced the biggest February domestic opening of all time and currently sits at #7 on the U.S. all time box office charts. 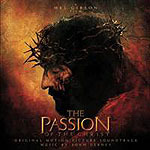 "The Passion of The Christ" official movie soundtrack (Sony/Integrity Music) has been certified gold by the Recording Industry Association of America (RIAA) and continues to be a top-selling soundtrack on the Billboard charts. The Debney composed soundtrack is the only recording that contains the music from the film. The soundtrack features haunting vocals and chants provided by Shannon Kingsbury, Shankar and Gingger, the Transylvania State Philharmonic Choir, The London Voices and Mel Gibson, who co-produced the soundtrack with Debney.